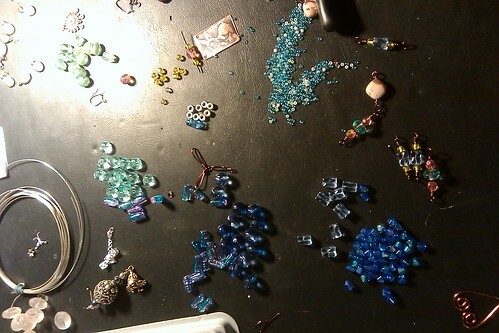 I was up all night into the early morning beading away. I have to say that the beading and making jewelry are one of the few things that bring me absolute piece where my mind is given over to creating and thoughts, fears, and emotions do not overwhelm me. After last night I realized that I SERIOUSLY need a better beading table/work surface 😦 I lost mine in a previous move 😦 Hopefully, this weekend I’ll be able to hit up the flea markets and junk shops around and find something that fits my needs. I have the perfect chain to go with the project I’m working on but I CANNOT find it anywhere and it about drove me crazy last night. But once I put aside all these frustrations, I had an excellent time and my creativity abounded! Hey Shelley! Email me! I go to Salisbury with ease!